On April 28, 2007, farmer-activist Jonas Burgos, son of Edita and the late press freedom icon Jose “Joe” Burgos Jr., was abducted by unidentified men and a woman while having lunch at the Hapag Kainan restaurant in Ever Gotesco Mall in Quezon City. He was dragged into a waiting van and has been missing since then. Jonas' love for farming and the poor farmers of the society prompted him to take up BS Agriculture at the Benguet State University. When he was abducted, he was a member of the Alyansa ng Magbubukid sa Bulacan (AMB), a provincial chapter of the Kilusang Magbubukid ng Pilipinas (KMP). While managing the family's farm in Bulacan, he shared his knowledge with other farmers and introduced organic farming to them. Since the abduction almost three years ago, the Burgos family, headed by Edith Burgos, has been searching relentlessly for Jonas. Mrs. Burgos has taken all the avenues -- courts, police, military, morgues, government agencies including the Office of the President, international organizations and the streets -- to look for her son. Edith Burgos now brings her search to the stage with a monologue dubbed as “Mrs. B." The one-act play will be starred by veteran actresses/directors Gina Alajar and Bibeth Orteza who will alternately play the role of Edith Burgos. It deals with the gamut of emotions a mother must go through in search of a missing son. "We have failed to find Jonas by going to the authorities. We cannot give up. We shall bring our search to any peaceful venue available to us and bring our cause to the people," states Edith Burgos. 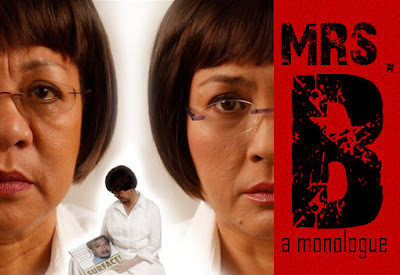 Mrs. B will be on its second run, the first in April 2008 with Pinky Amador as lead actress. Conceptualized and directed by Soc Jose of the tv series Darna and Full House, the play was written by award-winning playwright Joi Barrios together with Rowena Festin and Grundy Constantino of the Concerned Artists of the Philippines (CAP). It is being produced by Bienvenido Lumbera, National Artist for Literature. A joint effort of the Free Jonas Burgos Movement, Desaparecidos and CAP, the play will be seen on February 5, 6, 12 and 13, 2009 at 3 and 6 pm, at the Bantayog ng mga Bayani auditorium in Quezon City. For details and ticket reservations, contact Aya Santos at (632)434-2837 and +63.929.4414270 or Peachy Burgos at +63.916.7826374. You can also get your tickets starting this weekend at the Popular Bookstore and The Reading Room at Cubao Expo.